eMarketsTrade is a cryptocurrencies broker. eMarketsTrade offers the Mobile cryptocurrency trading platform. 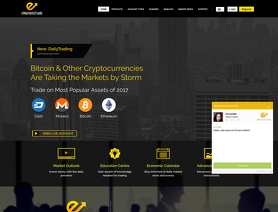 eMarketsTrade offers bitcoins and other cryptocurrencies for your personal investment and trading options. I started with a small amount of €. Then the phone calls started "if you add this? Amount we will get you? Amount" witch I did and then they asked for more and more for ICO investment. They even asked to look in my bank account and then said you can afford to add more. Then all they gave me was bad information and lost the lot without investment in ICO. Next I get a call from recovery asking if you add? We will recover your loss. we will only place 12 percent to get your money back, so I did and the next day calls started for more money and to also look in my bank account,. This kept up for days until they believed I would put no more. They gave me advice and instead of 12 percent the lot was gone again at this time I was down high double figure thousands € and credit card max to pay. My advice to anyone thinking of investing in this company is don't and don't answer the phone as I had to threaten them with this to stop them asking for more money. I have had people email me with exactly same happened to them. Only give money to Emarketstraders unlicensed scam if you don’t want to see it again. The amount of successful trades on your account is minimal (Actually, the successful trades is not worth mentioning because the money lost far overshadows any trade closing in "profit"). Your broker keeps on asking for more money so as to be able to move your account to a "department" with more benefits and the "promise" of higher profits. This never happens! They will open trades motivated by web sites flashed in-front of you describing how the market is moving in the direction of the opened trade, and then the market does exactly the reverse resulting in the loss of your money, and guess what? Yes, they want more money so your account does not go into a "Margin Call" and you loose your money including the so called bonuses! Please do not loose your money as I also did! eMarket Trade, They are a SCAM, Please don't use them. I invested with them in October / November 2017. They kept calling me, "Put more money in so you can get a senior broker, to trade your account" Then they tell you "If you put in $2000.00 or so, they will give you a bonus of $1000.00 to help your account on" They will try this several times, making small trading profits along the way, Just to pull you in deeper, and get you to invest more. They will then invest your money into some crypto's where you can only select to trade one full bitcoin or 30 X XRP (High quantity of trades), this uses up all your capital, then they will call you to invest more as your margin is running low. They made large trades when the markets were going down at the end of December, early January, These are the people who are supposed to know and study the crypto markets.....YOU WILL ALWAYS LOOSE. Close your loosing trades and think you can withdraw your funds, Think again.....you are tied in with the bonuses they gave you. They then tell you, you have to continue trading until you reach the bonus goals, This is impossible. You will have to keep trading, until you have nothing left. They won't even release the last little $400 dollars left in your account because of the bonuses. PLEASE PEOPLE, DON'T INVEST WITH eMARKETS TRADE, Please warn anybody that wants to trade crypto's.